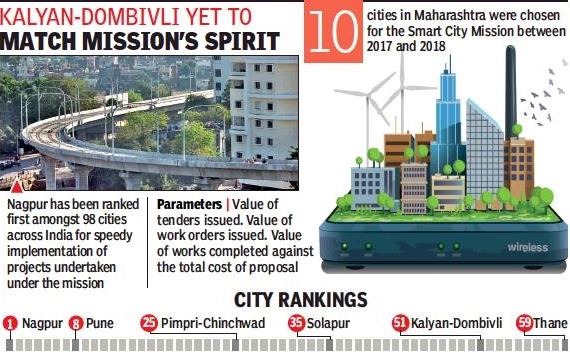 Seven of the ten Maharashtra cities selected for the Narendra Modi government’s Smart Cities Mission have got their infrastructure projects off the ground. In the latest report card on the mission, while Nagpur ranks first for speed of implementation, Thane is a distant 59, with the others in between. Pune has made considerable progress and is now ranked eighth nationally. The rankings, in terms of work initiated, were released by the Union ministry for urban affairs. Being chief minister Devendra Fadnavis’s hometown, Nagpur enjoys an edge over the other cities. There was no dearth of funds for the city’s two proposals: Rs.524 crore was given for installing a CCTV network and Rs.3,303 crore for Smart City area development for an area of 1,743 acres in east Nagpur. Kalyan-Dombivli has drawn up plans for 28 civic projects but so far, work has started only on a Rs.65-crore park. Under the mission, the city has received Rs.360 of the sanctioned Rs.1,445 crore. The other projects include a creek waterfront, Kalyan railway station modernisation, installation of modern traffic signals and CCTV coverage. Thane has several projects, including the Thane east station area traffic improvement system, a new railway station between Thane and Mulund, and water supply and sewage upgrade. Activists complained that projects are being executed without proper planning. “Projects like the alternative railway station are being executed even though land required for the project is yet to be handed over to the corporation. The waterfront project is another such example,” complained an activist. Pune has so far executed nine projects. Of the Rs.490 crore received, city authorities have spent Rs.140 crore. Work orders for 17 projects have been issued while tenders for another 38 projects are being processed, said officials. Pimpri-Chinchwad was included in the mission three years after the programme was started, “but we are on par with cities that were included in the second round”, said Neelkanth Poman, joint CEO of that city’s Smart Cities project.